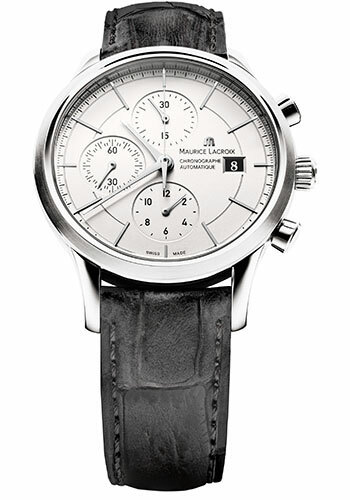 41mm stainless steel case, silver dial, automatic ML 112 movement with chronograph and date, black leather strap. Water resistant to 30 meters. 41mm stainless steel case, silver dial with gold plated indexes, automatic ML 112 movement with chronograph and date, brown leather strap. Water resistant to 30 meters. 41mm stainless steel case, black dial, automatic ML 112 movement with chronograph and date, black leather strap. Water resistant to 30 meters. 41 mm polished and brushed stainless steel case, domed sapphire crystal with anti-reflective coating, black dial with diamond cut applied hour markers with Superluminova SLNC1 and diamond cut hand with white Superluminova SLNC1 on hours and minutes hands, personalized ML 112 self winding automatic movement with hours and minutes indicated by central hands, small second indicated by disc at 9 o'clock, chronograph second by center hand, 30 minute chronograph counter at 12 o'clock, 12 hour chronograph counter at 6 o'clock, date indicated by opening at 3 o'clock, vibration 28 800 alt/h, 4Hz, 25 jewels, adjustment 3 positions after full winding and after 25 hours, approximately 48 hours of power reserve, black with red stitching calfskin strap, bracelet 7 row stainless steel combining polished and brushed finish, stainless steel buckle folding. Water resistant to 30 m/3 atm. 41 mm polished and brushed stainless steel case, domed sapphire crystal with anti-reflective coating, silver dial with diamond cut applied hour markers with Superluminova SLNC1 and diamond cut hand with white Superluminova SLNC1 on hours and minutes hands, personalized ML 112 self winding automatic movement with hours and minutes indicated by central hands, small second indicated by disc at 9 o'clock, chronograph second by center hand, 30 minute chronograph counter at 12 o'clock, 12 hour chronograph counter at 6 o'clock, date indicated by opening at 3 o'clock, vi, approximately 48 hours of power reserve, stainless steel bracelet 7 row stainless steel combining polished and brushed finish, stainless steel buckle folding. Water resistant to 30 m/3 atm. 41 mm polished and brushed stainless steel case, domed sapphire crystal with anti-reflective coating, black dial with diamond cut applied hour markers with Superluminova SLNC1 and diamond cut hand with white Superluminova SLNC1 on hours and minutes hands, personalized ML 112 self winding automatic movement with hours and minutes indicated by central hands, small second indicated by disc at 9 o'clock, chronograph second by center hand, 30 minute chronograph counter at 12 o'clock, 12 hour chronograph counter at 6 o'clock, date indicated by opening at 3 o'clock, vi, approximately 48 hours of power reserve, stainless steel bracelet 7 row stainless steel combining polished and brushed finish, stainless steel buckle folding. Water resistant to 30 m/3 atm. 41 mm polished and brushed stainless steel case, domed sapphire crystal with anti-reflective coating, blue dial with diamond cut applied hour markers with Superluminova SLNC1 and diamond cut hand with white Superluminova SLNC1 on hours and minutes hands, personalized ML 112 self winding automatic movement with hours and minutes indicated by central hands, small second indicated by disc at 9 o'clock, chronograph second by center hand, 30 minute chronograph counter at 12 o'clock, 12 hour chronograph counter at 6 o'clock, date indicated by opening at 3 o'clock, vi, approximately 48 hours of power reserve, stainless steel bracelet 7 row stainless steel combining polished and brushed finish, buckle folding. Water resistant to 30 m/3 atm.